EW.com revealed that Jorja Fox (Sara) has renewed her commitment to CSI. 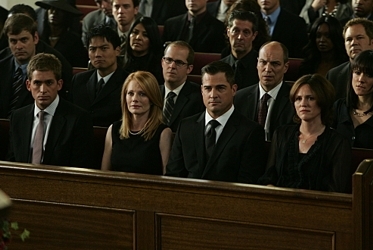 According to EW, Fox has signed on to return for the procedural’s upcoming 11th season. Of course all terms of her new contract are being kept tightly under wraps so it’s unclear how her billing will play out. Will she be billed as a recurring guest star or back to her original series regular status? I was sad to recently read in Women’s Wear Daily (WWD) that Stuart passed away suddenly at his home on June 14th at the age of 54. The cause of his death was not made public. Although I didn’t know Stuart Wayne Gavert personally, I was very familiar with his amazing hair color work over the past 15 years of covering hair and beauty trends. 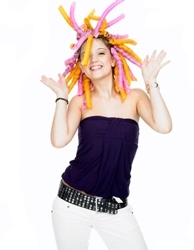 Stuart was in the hair profession for thirty years and a hair color specialist for twenty-five. He was based in New York in the early 1980s, but eventually moved to California. 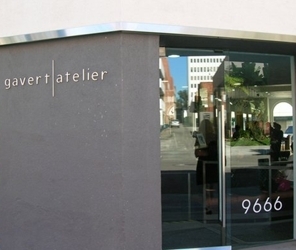 He eventually joined forces with his partner Cody Kusakabe to open Gavert Atelier Beverly Hills in 1998 which attracted many big name celebrity clients like the Hilton sisters, Christina Applegate,Shannon Doherty and many others. Stuart traveled the world teaching other hair professionals the latest in color, formulation and technique. He was known to go the extra mile helping others to learn about hair and color. I was definitely a fan of his work and passed by his Gavert Atelier salon the last time I was in Beverly Hills in May of 2010. For those not in the professional hair industry you might know Stuart as the hair stylist responsible for coloring Rob Pattinson and Kristen Stewart’s hair for Twilight. Yes, my saga with air travel continues. First there was the recent double punch of an American Airlines trip from Dallas to Burbank (regional airport near Los Angeles) where I sat for hours on the return leg waiting for a mechanic to drive a part to the plane from LA. I was less patient than normal on that trip because on the first leg from Dallas, the AA plane was also sent back to the terminal due to, you guessed it, a mechanical problem. Two mechanical issues on two different planes on just one trip was a show stopper for me. Fed up with American Airlines, their delays, and all their never ending rules I switched for my next trip to US Airways. I was in air travel heaven for my trip from DFW to San Diego. The US Airways planes departed and landed precisely on time, I had tons of leg room, the seats were nice and the restrooms were fresh and clean. Ahhh. 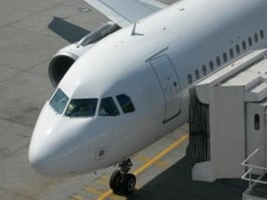 Even though I had to change planes in Phoenix, I was very impressed with US Airways. They also seemed to have less rules and more pleasant flight attendants. Maybe I was just annoyed with American at that point but US Airways won my favor for sure. I just noticed a news item and matching video on UTube which showed Rihanna entering the Spanish Kitchen Restaurant in Los Angeles last evening with her entire entourage. According to reports, the restaurant closed just for the star to dine in private. 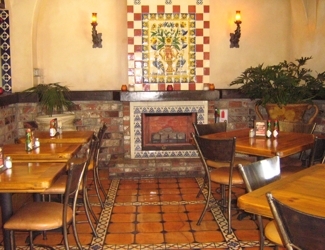 Not only have I been to Spanish Kitchen, I make it a point to eat there every time I visit Los Angeles. 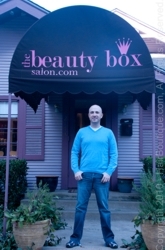 In both April and September of 2009 I made several memorable visits to the iconic restaurant with HairBoutique.com’s Edan Kencayd. The dining establishment has a long and interesting history dating back to the 1940s and the glamour days of Old Hollywood. Earlier this evening I had an amazing interview with celebrity hairstylist Ken Paves who has been busy with Jessica Simpson promoting “The Price Of Beauty” on Vh1 which premieres tomorrow night (March 15, 2009, 10 EST/9 CST). Before I even discuss Ken’s comments about his amazing journey making the series I need to start at the very beginning which for me started last year in Los Angles. 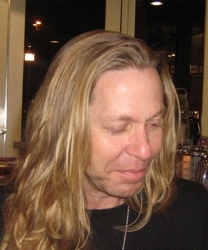 Image of Robert Hallowell – May 2009 in Los Angeles, California – Photo by Karen Marie Shelton & Edan Kencayd – HairBoutique.com – All Rights Reserved. If you’ve been reading any of my Blogs (Hollywood & Mane, HairBoutique Blog) or my regular columns in 101 Celebrity Hairstyles, Short Cuts Magazine or HairBoutique.com over the past 10 years, you may already have read many of my pieces about Robert Hallowell. I find Robert, Robair or Rawbert, to his friends, so incredibly fascinating I couldn’t stop covering his life. His fun filled life was like peeking in on a reality show. Note: Robert Hallowell passed away on November 25, 2015. Yes, I’ve written volumes about many many other famous hairdressers, but I kept circling back to Robert (Raw for short) on a regular basis. Of course I understand Hollywood hairstylist concerns. One misquoted comment could destroy an up and coming hair, make-up or fashion styling career in an instant. They could be drummed out of Hollywood forever. 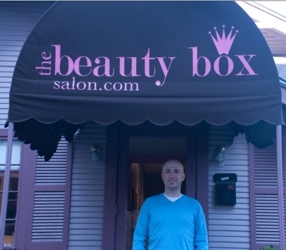 Robert named his hair company The Kitchen Beautician. Why? Because he often ended up working in the kitchens of his celebrity clients’ homes. Sometimes Robert would use ingredients right out of their cabinets. and featured a breathtaking patio/deck overlooking the city . Robert was an extremely busy man working an average of 18 hours per day doing celeb hair. He always made time for me. It was another reason I loved writing about him and his clients. 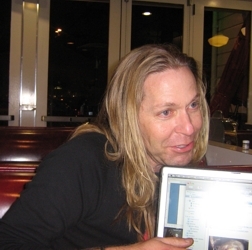 Image of Robert Hallowell at Johnny Rocket’s Restaurant at The Grove showing off a photo of his cat Handsome – May 2009 in Los Angeles, California – Photo by Karen Marie Shelton & Edan Kencayd – HairBoutique.com – All Rights Reserved. I learned to settle quietly into a kitchen or patio chair while the double Gemini buzzed back and forth in a frenzy doing a million things at once. If I tried to follow his footsteps I would collapse in mere minutes. I sat back, flipped on my recorder and bombarded him with questions about hair care, hairstyling techniques, hair trends, hair history…well, just about anything which had hair attached to it. Even though I asked Robert crazy questions, he always rose to the challenge and gave me wonderful answers. I asked him which of his celebrities had the best hair to work with, which had the worst and why. He was always kind and thoughtful with his responses. Sometimes he will roll his eyes at me, make a variety of faces, say “pish posh” and then laugh with his wicked chuckle before answering my questions. Yes, he always asks me…is this off the record or not…and then we go from there. 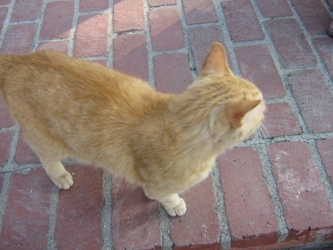 IImage of Robert Hallowell’s Cat Handsome hanging out on robert’s hillside patio – May 2009 in Los Angeles, California – Photo by Karen Marie Shelton & Edan Kencayd – HairBoutique.com – All Rights Reserved. He knows all the juice about hair in the business, whether its New York, LA, Europe, Canada or Mexico. Not only has Robert worked with a dizzying array of Hollywood’s royalty for over 20 years, he has worked with other hairdressers, make-up artists, fashion stylists, magazine editors, agents, photographers and of course pesky media like me. Unlike some other Hollywood hair gurus, Robert is never starstruck. Maybe because he was born and raised in LaLa Land or maybe because he is so unaffected and genuine, he is never full of himself or impressed that he literally hangs out with some of the biggest names in the film and movie industry. One of the criticisms which is sometimes made about celebrity hairdressers, make-up artists and related pros is that they develop big heads and don’t recognize their place in the big picture. Afterall, they have a job to do and if they lose sight of that focus, drama ensures. They really aren’t the celebrities, they are there to service their celebrity clients. Robert always knows his place and understands his role. He is also always 100% focused on getting the job done and taking care of his clients. Case in point is the 3+ hours he spent with a long time male superstar client whose hair he’s been cutting and styling for years during my last long visit with him. 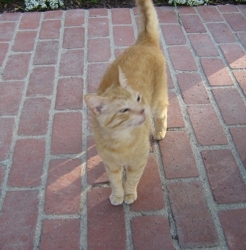 Image of Robert Hallowell’s Cat Handsome hanging out on Robert’s hillside patio – May 2009 in Los Angeles, California – Photo by Karen Marie Shelton & Edan Kencayd – HairBoutique.com – All Rights Reserved. Robert religiously drives over 1 hour to this celeb’s digs adjacent to Malibu and settles in for “a long haircut”. He warned met even though the celeb in question has relatively short hair it might take 3-4 hours to finish the cut and style because Robert wanted to make sure his client was 1000% happy with the results. Indeed, it took him over 3 hours, but his client was ultimately ecstatic with the finished style. In Robert’s mind that’s all he cared about. I was so impressed with his compassion and care for his client. Robert understands only too well the pressures actors and actresses go through in the cutthroat industry and tries his best to help them in any way possible, even if it means spending three hours for a snip that might normally take 15 minutes. I adore that about Robert. It also makes me feel completely safe with him at all times because I know if he doesn’t kiss and tell about some of the biggest names in Hollywood he won’t ever kiss and tell about me. Like any longtime friendship or professional collaboration it hasn’t always been rainbows and lollipops between Robert and I. We’ve had moments, which lasted for months, where we were not getting along. At one point we didn’t talk for almost one year because of a communication misunderstanding. We eventually worked it all and Robert was one of the first to call me when he heard my beloved husband had died suddenly of a heart attack in early 2005. During my first visit to Robert’s house he showed me the urn which held the ashes of his own deceased wife who died of cancer many years ago. He also showed me a photo of his current true love, a handsome European actor he hopes to spend time with someday when one of the two men can find a way to move to the appropriate location. It was all bittersweet, but very touching at the same time. Meanwhile, after sharing a piece of his heart, Robert’s double Gemini personality will instantly kick in and he’s off running down the hallway towards his famous kitchen making sure the cats aren’t swiping cheese off the table, the lemons soaking in the sink are ready to be removed or to search for that box of wigs he dragged down from his studio. It’s just all in a day’s time during the life and times of a fabulous Hollywood hairdresser, hard working, kind and loving human being. Although he’s a brilliant hairdresser and beauty expert he’s also just a fun guy. It’s a special treat to hang out in the kitchen with Robert while he whips up his latest hair mask. Do you see why I never tire of writing about his life? Born and raised in Los Angeles, Robert started his professional career as a model in LA. Ultimately he made his way to modeling in New York. He eventually decided to change careers, attending cosmetology school at the prestigious Vidal Sassoon Academy in LA. Robert landed his first hair design job for a music video in 1984 while he was still finishing up his classes. He’s been working in the entertainment industry ever since. A very dedicated hair stylist, Robert toiled on a lot of lesser known television shows before he met actress Geena Davis on the set of Angie in 1994. He quickly became her stylist of choice, creating most of her off-screen looks and coiffing her for The Geena Davis Show and Commander in Chief. He was the preferred hairstylist of Brendan Fraser, traveling with him on various film premiere tours. Additionally, he’s worked with Lucy Liu, Sarah Jessica Parker, George Clooney and many other movie and television stars. He’s currently the Head Hairdresser for CSI where he designs all of the hair looks for the cast but primarily coifs the tresses of Marg Helgenberger and CSI guest stars. He worked with Courteney Cox for two seasons on Dirt. Some of his other celebrity heads over the years included Mary Louise Parker, Elizabeth Perkins, Jennifer Love Hewitt, Camyrn Manheim, Holland Taylor, Jon Cryer, Charlie Sheen, Donald Sutherland, Hugh Laurie and Bridget Fonda. The list is endless. Robert has been an on-set hairdresser for an endless number of TV shows as well as a wide range of movies. He has met countless celebrities, even if he hasn’t personally worked with them including the Osbournes, Ellen DeGeneres and Oprah. I recently flew from Dallas to Los Angeles to spend time with longtime Hollywood Hairdresser Robert Hallowell. Over the years Robert, whom I adore, has been beyond generous with his time and willingness to share information about his hair and make-up work in the TV and film industry. (Image of Ashlee Simpson – DailyCeleb.com – All Rights Reserved). While hanging out at the famous Hilton Checkers downstairs lounge I asked Robert his thoughts about Ashlee Simpson’s current red hair for The CW’s new Melrose Place. Even though Robert hasn’t personally worked with Ash, he thinks “she lovely” and has followed her well-documented hair color history where she transitioned through a wide range of hair colors from baby blonde to Raven black and ultimately a variety of red hues, which she appears to prefer.